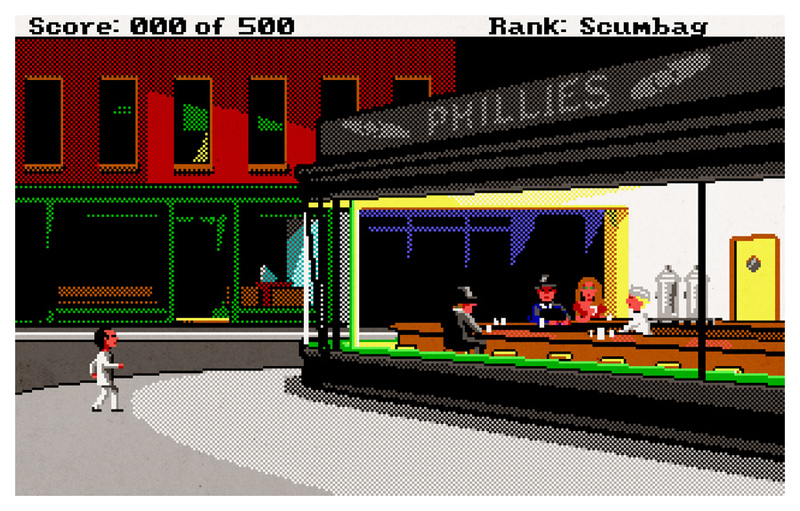 Have you ever thought of Edward Hopper's iconic "Nighthawks" painting while playing a Leisure Suit Larry game? I sure as hell haven't. Of course, my only memory of this Sierra On-Line series is of sneaking into my uncle's office as a teen to play Leisure Suit Larry in the Land of the Lounge Lizards on his Apple IIGS while he and my parents drank margaritas and played cards (hey, we were on vacation), so maybe I just haven't spent enough time with these saucy point-and-click titles. Anyway, although I'm sure I'm not alone in having never imagined a visual mashup involving Leisure Suit Larry and "Nighthawks," at least one person has imagined such imagery: artist Aled Lewis, whose resulting illustration (below), titled "Just Another Sleazy Joint," is included in the SUPER iam8bit show that kicked off in Los Angeles last night. Also included in the above-mentioned show are three similar mashups: One ("Divine Intervention") involving Leonardo da Vinci's "The Last Supper" and Police Quest: In Pursuit of the Death Angel, another ("How Appropriate, You Fight Like A Post-Impressionist") involving Vincent Van Gogh's "Cafe Terrace On The Place Du Forum 1888" and The Secret of Monkey Island and a third ("Indiana Jones and the Persistence of Memory") involving Salvador Dali's "The Persistence of Memory" and Indiana Jones and the Last Crusade: The Graphic Adventure. Oh my gosh...I'd forgotten about completely about Police Quest...wow. But what I really wanted to say is that I appreciate any and all parodies of Nighthawks, from the Simpsons to Veggie Tales to Leisure Suit Larry. Someday I'll frame them all. Hopper is my favorite artist. I'm sad to have to admit, Justin, but I've never played Police Quest! Hell, I've barely played any of Sierra On-Line's game, except for the first Leisure Suit Larry and the first King's Quest (I think). I'm going to have to look for an emulator that will allow me to play them at some point. As for Hopper and Nighthawks: I agree! Actually, I don't consider Hopper my favorite artist, but I do appreciate and like his work. It's amazing to me how this piece in particular never fails to produce (for me) a feeling of deja vu, despite the fact that I've rarely (if ever) been in a sleepy diner at night. That's what I love about his work...almost ALL OF it feels like home to me...it's familiar and comforting. And yeah...play Kings Quest VI. Play Space Quest 4. I'm going to have to check out more of his work, then. I know I studied him at least a bit in college, but I just don't remember much of it. As for playing King's Quest VI and Space Quest IV -- I'll definitely do my best! Thanks for recommending them, BTW.